Formed in 2005 from the remains of Ashen Mortality, My Silent Wake is one of the UK's best death/doom bands. Since the very beginning the group has been lead by vocalist/multi-instrumentalist Ian Arkley (Seventh Angel, Century Sleeper). Although the background members have come and gone, Ian's vision has kept My Silent Wake not only alive, but consistently evolving and thus improving. Now in it's thirteenth year of existence, My Silent Wake Over has a huge back catalog to it's name. Not only are there multiple full-length recordings, but there are numerous EPs and singles, several compilations, a promo DVD, and two splits! 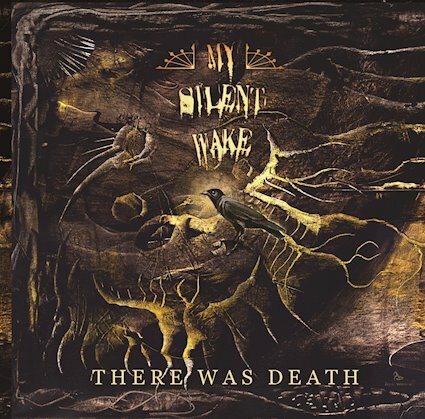 Recorded, produced, mixed, and mastered by Greg Chandler (Esoteric) at Priory studios, "There Was Death" is the tenth full-length album by My Silent Wake. It is the follow-up to 2017's "Invitation to Imperfection". While I choose not to cover that particular album for a variety of reasons (one of which was because it is largely a instrumental release) I did review 2015's "Damnatio Memoriae". At the time I called it "My Silent Wake's strongest release to date".With a release date of February 16th, 2018, "There Was Death" is every bit as good as "Damnatio Memoriae" was. What's more, "There Was Death" is packed with some of My Silent Wake's heaviest material to date! At this point in the game My Silent Wake has developed a unmistakable sound. Anyone that has been following this incredible band for awhile has no doubt picked up on that fact. With "There Was Death" that distinct, somewhat (slowed down) doom rock meets (sorrowful) goth rock sound is still present. As cool as it is that side of the band serves as the album's foundation. With producer Greg Chandler providing keys and some extreme vocals (well, it's more like he is growling into the mic and/or screaming, but it is still epic!) and Ian (vocals/guitars) looking to push the boundaries as far as they will go(! ), the one hour long "There Was Death" finds My Silent Wake armed to the teeth for what will be very primitive, hand to hand, combat. The conflict isn't physical though. Like numerous other albums, "There Was Death" deals with spiritual issues (lyrically) while the actually music smothers you under it's mighty weight. At their heaviest/most savage and with some of the best material to date at their disposal, the members of My Silent Wake have gifted the metal community some impeccable music. Longtime fans of My Silent Wake should love this well-crafted disc of formidable death/doom. For anyone new to the group, My Silent Wake is simply doing what they do best: improving upon perfection. As always this is stellar death/doom from a musical mastermind that is known as Ian Arkley. It's a complex and sometimes challenging band that has taken England by storm along with much of the U.S. With albums like "There Was Death" the world should be won over, but only time will time as far as that wish of mine goes.